Head Coach for Kumasi Asante Kotoko, Charles Kwablah Akonnor said he is expecting a difficult match against Aduana Stars in their opening match of the Ghana Football Association (GFA) Normalization Competition (NC) Special Competition this Sunday. The Porcupine Warriors turn attention from continental competition to domestic football this weekend as they host the ‘Fire Boys’ from Dormaa. Having enjoyed a good run in the CAF Confederations Cup, the stakes are high for the Kumasi based side to show up once again and perform to the highest level. Speaking to Class FM ahead of the clash, CK Akonnor stated that it’s not going to be easy for his side as all the other clubs will be motivated to beat them. “It’s not going to be easy. If anybody is playing Kotoko, on their side it’s a different ball game altogether. Plus the fact that we have played in the Confederations Cup, more eyes are on us. They know what they have to do”. “So it makes it very difficult but it’s up to us. 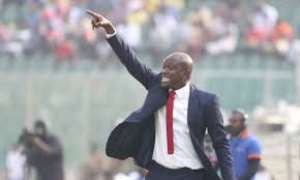 Our mentality, the strength in which we work and what we believe in,” Coach Akonnor said. He further noted that it is their goal to return to any of the continental competitions next season and they are going to do what they can to ensure they win the NC Special Competition to have any chance at booking a spot. “We have been able to experience the Confederations Cup, Of course, we want to do well and get there again. AshGold and the rest are also eager to want to experience it. What excuse again do we have? We want to experience the championship again and so there is the need for us to put in every necessary effort to try as much as we can to win it,” he said. Kotoko’s match with Aduana Stars will be played at the Baba Yara Sports Stadium on Sunday at 15:00GMT.